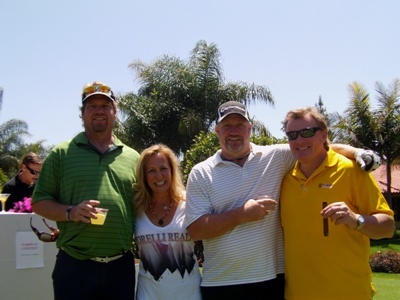 It’s a sensational day for golf in Costa Mesa, California. Today Torelli Realty is hanging out on Hole 17 at the Mesa Verde Golf Course sponsoring the 5th annual Mesa Verde Golf Tournament. The tournament supports Costa Mesa United, which is raising money for youth sports. Torelli Realty agents who are manning the hole have met a lot of great people who are out today supporting the Costa Mesa youth. Everyone is loving the music and drinking the martinis being mixed at Hole 17. Steve Mensinger has been by all ready and so has Estancia High School principal Phil D’Agostino and Guy Herbert of Anaheim Ducks fame. Herbert even signed autographs for the Estancia Football Team who sent spotters to keep track of the ‘Keep It In The Fairway’ contest. Guy Herbert and Estancia Football "Spotters"
The Golf Tournament is well underway and there’s still a couple of hours to go until the dinner. It’s a privilege to help Costa Mesa United improve youth sporting conditions. About Torelli Realty: Torelli Realty is proud to offer home improvement and home staging tips to help your home’s value throughout Costa Mesa and in Mesa Verde. The company has been servicing Costa Mesa, CA almost excludively for over 25 years and knows Costa Mesa real estate. We also have an expert on staff, Holly Schwartz, who came to us as a producer from Home and Garden Television (HGTV) and extensively studied home values and markets locally and nationally. Feel free to contact Torelli Realty for a consultation and for all your real estate needs. 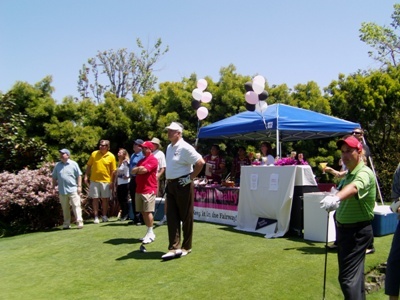 This entry was posted in Costa Mesa schools, Fundraisers and tagged costa mesa, Costa Mesa Real Estate, Costa Mesa schools, Costa Mesa United, Costa Mesa youth sports, Estancia High School, Mesa Verde, Mesa Verde golf tournament, Torelli Realty. Bookmark the permalink.